AMD took the wraps off its next-generation RX Vega graphics cards during an event last week. What we now know is that RX Vega will arrive at retail soon enough, priced at $399 ($370) for the '56' and $499 for the '64' air-cooled card. This also means that AMD does not intend to proliferate RX Vega further down the stack imminently. And that is precisely why we still need to keep a careful eye on current Radeon RX 500-series cards, especially the RX 570, as it isn't going to be replaced any time soon. Said GPU has been available for a few months, but we say available rather loosely, as stock levels remain low due to a renewed interest in cryptocurrency mining. Damn those miners, eh? Such constraint has pushed up the price of RX 570, which is ostensibly last year's RX 470 with uprated clocks and a couple of new features, to around £250. This is also the space occupied by the GeForce GTX 1060 3GB and entry-level GTX 1060 6GB cards from rival Nvidia, so it's important to see, in mid-2017, who offers the best value. We have also mentioned many times that Sapphire is arguably AMD's best add-in board partner through a combination of efficient, considered cooling and competitive price. Hitting the second note in particular, the company launched the no-frills Pulse line of cards recently, so now is a good a time as any to take a closer look. The RX 570 Pulse 4GB card looks much like the RX 580 Nitro+ on first glance but looks alone can be deceiving. The Pulse does away with dual BIOSes, the side-lit Sapphire logo, additional LEDs, and higher speeds through Nitro Boost. That's no bad thing as those features inevitably push up the price. 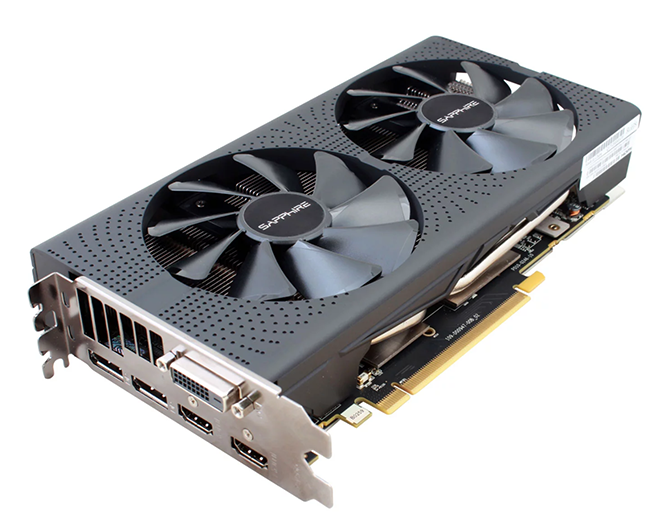 This card has much more in common with last year's RX 480 Nitro, yet is 10mm shorter, measuring 230mm, whilst sitting 125mm high and 41mm thick. If you think that is relatively restrained for a midrange AMD card, Sapphire also has a single-fan Mini ITX version for smaller chassis. We continue to like Sapphire's design, as the dotted heatsink plays well with the twin 95mm spinners that stay switched off when GPU temperature is below 60°C or so. Should either of the fans fail during the warranty period, Sapphire's Quick Connect system means they can be replaced without having to send the card back. Sapphire doesn't see merit in reinventing the wheel so keeps the same five outputs as last year, comprising dual HDMI (with presumably one for VR duties), twin DisplayPort and a single DVI. There's room for a small vent, which is necessary as the card is mostly an enclosed design. 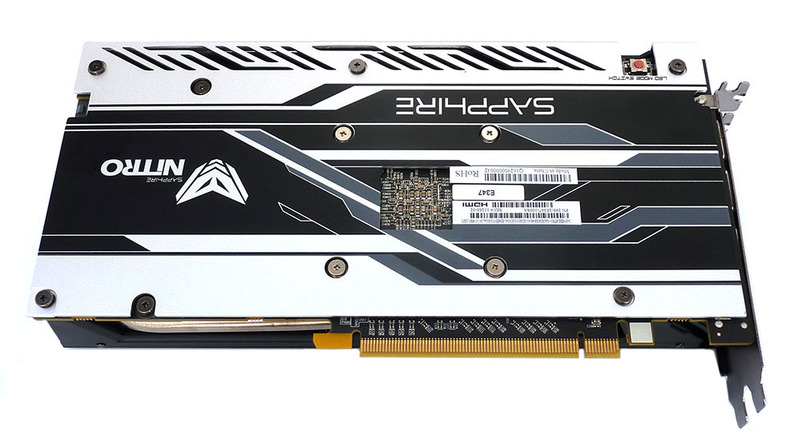 This model isn't a carbon copy of last year's RX 480, mind, as the 8-pin power connector is moved on over from the front to the side, which makes more sense if it is to be installed in smaller-than-average cases. Sapphire uses a simple heatsink for this 180W-rated card, with twin 6mm-thick heatpipes going through the aluminium fins. The core, meanwhile, connects to a copper insert, while Sapphire does the sensible thing and includes thermal pads for the 4GB of memory and VRMs. 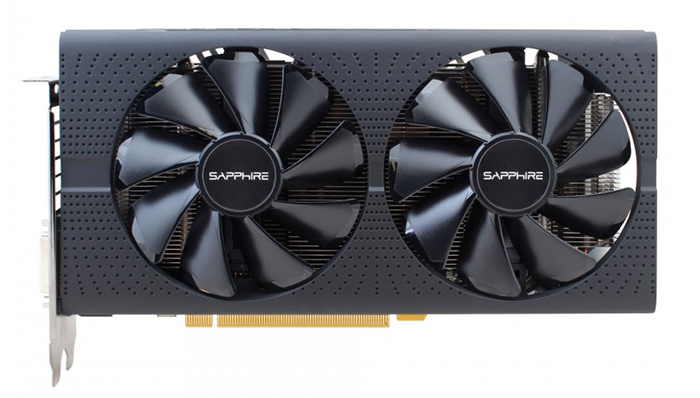 Costing around £250 presently and therefore one of the more affordable RX 570s, Sapphire still offers a modest overclock, as the core speed is increased from 1,244MHz to 1,284MHz. Memory, however, is kept at the stock 7,000MHz. 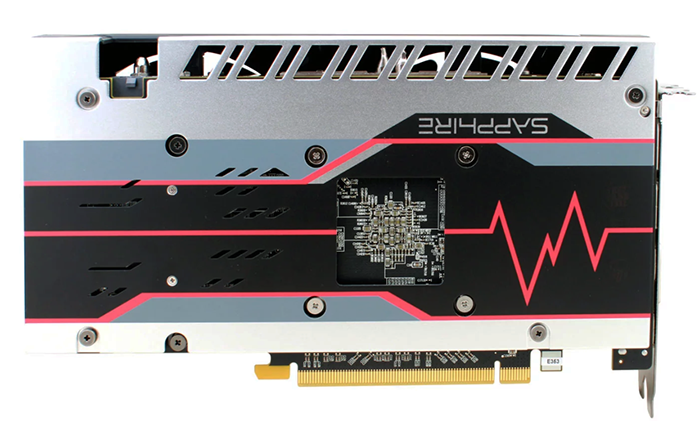 It's good to see a card-wide backplate on a company's budget RX 570 model, but we're left wondering why Sapphire chose to go with a pink, grey and silver colour scheme; we much rather prefer the RX 480's theme instead. It's a sign of the times when a slower RX 570 can cost £50 more than the RX 480 Nitro 4GB from exactly a year ago, though end-user pricing remains out of Sapphire's control. Appreciating that no RX Vega card is on the horizon at this price point, AMD needs to do well against the GeForce GTX 1060 in this crucial segment. Let's see how it does.